This week, Congress is dedicated to spending all its time on spending. Negotiators reportedly worked through the weekend to finalize the details of the $1.3 trillion omnibus appropriations bill that would fund the government for fiscal year 2018 that ends September 30. The release of the legislative text is expected late on Monday, March 19 and must be passed by March 23 to avoid another federal government shutdown. Also this week, the House Appropriators will hold nine subcommittee hearings on spending plans for fiscal year 2019, which starts on the first of October. Johnson Amendment: See article, below. Spending Levels: In February Congress passed the Bipartisan Budget Act of 2018 (BBA), a two-year budget deal authorizing spending $296 billion more in the current and next fiscal years than authorized in previous budget control legislation. The BBA boosts defense and nondefense discretionary spending caps by $296 billion over two years: $165 billion for defense, and $131 billion for nondefense. The 12 separate Appropriations subcommittees have been working over the past six weeks divvying up the new money. Which programs are winners, which break even, and which lose funding will be revealed when the omnibus spending bill is released later today. Immigration: Rumor has it that the omnibus won’t include language that resolves the status of Dreamers under the Deferred Action for Childhood Arrivals (DACA) program that the President cancelled last year. The White House reportedly offered a three-year extension of DACA in exchange for three years of appropriations to fund the proposed southern border wall featured in the presidential campaign. Health Care: Word has leaked out that the omnibus spending bill will include $30 billion in continued funding for outreach, enrollment, and subsidies to insurers under the Affordable Care Act (Obamacare). Campaign Finance: Will several poison pill riders in an earlier House-passed bill remain in the final deal? These include language to loosen campaign finance coordination limits, prevent the U.S. Securities and Exchange Commission from requiring public companies to disclose to shareholders their political spending, and eliminating a rule requiring federal contractors to disclose their political spending. There’s no public word yet on whether the mammoth spending bill will include an anti-Johnson Amendment provision that would effectively block enforcement of the law that prohibits 501(c)(3) organizations from endorsing or opposing candidates for public office or divert charitable assets to political campaigns. As discussed above, the omnibus spending legislation is expected to be made public later today. The House has passed two versions of anti-Johnson Amendment provisions. In September, it included language in an earlier appropriations bill that gave partisan leaders of “churches” virtual free rein on endorsing candidates and embedding partisan political activities – including spending church assets – in the operations of religious organizations. The first version of the tax bill that passed the House included language that would have weakened the Johnson Amendment protections by adding vague and undefined terms that the Joint Committee on Taxation estimated would incentivize taxpayers to divert billions of dollars in political contributions to newly politicized churches and charitable organizations so that the taxpayer could, for the first time, claim charitable tax deductions. College Endowment Excise Tax Repeal: A bipartisan bill was introduced to repeal an excise tax on college endowments imposed under the new federal tax law. Approximately 30 colleges and universities – those with at least 500 students and more than $500,000 in endowment per student – would be affected by the tax, which is expected to cost them about $200 million annually. Small Employer Health Savings Accounts: Senator Mike Enzi (R-WY) introduced the Small Business Health Account Act of 2018 to establish tax-exempt health savings accounts for small business employees. Under the Act, eligible individuals would receive a tax deduction for the amount paid in cash into a small business health account of the individual. Taxpayer Advocacy Panel: Thirty-two new members have been selected to the Taxpayer Advocacy Panel, a federal advisory committee “charged with providing taxpayer suggestions to improve IRS customer service,” the Internal Revenue Service announced. The panel consists of 73 volunteers to listen to taxpayers, identify issues, and make suggestions on customer service for a variety of topics, with an emphasis on wages and small employers. Members of Congress are demanding answers about state efforts to help taxpayers overcome the $10,000 cap on state and local tax (SALT) deductions under the new federal tax law. State lawmakers in at least eight states (California, Connecticut, Illinois, Nebraska, New Jersey, New York, Virginia, and Washington State) are considering, or have considered, legislation to allow taxpayers to pay their state and local taxes by making charitable donations of equal amounts to government “charities” and treat the payments as charitable deductions under the new federal tax law. Referencing various SALT workaround state bills, Illinois Democratic Senators and Representatives in Congress wrote the Republican Governor asking how he plans “to protect Illinois residents who will now be double taxed on state and local taxes over $10,000.” They point out that 1.9 Illinois households (31 percent) claimed the SALT deduction in 2015 and averaged $12,523 in deductions, and cite SALT workaround legislation in other states as they pledge to work with Governor Rauner “to mitigate the negative impacts” of the federal tax law. Legislation introduced last week in the Minnesota House would expand the state’s non-itemizer deduction by removing current limits so that all taxpayers would be able to deduct 100% of their charitable giving from state taxes. Minnesota’s current non-itemizer deduction allows taxpayers to deduct 50% of their deductions above an initial $500 threshold. For example, a person donating $2,000 to charitable organizations is able to deduct $750 ($2,000 - $500 x .5 = $750). A Senate companion bill is expected in the coming weeks. The Minnesota Council of Nonprofits, along with a church leader and another nonprofit executive director, testified last week that the legislation is needed to address the unintended consequences of decreased giving from those who will no longer itemize on their income tax returns as a result of the new federal tax plan. Two-thirds fewer Minnesotans are expected to itemize their income tax returns under the new federal tax plan. Minnesota and Colorado are the two states with non-itemizer deductions. A bill introduced in New Jersey last week would likewise extend giving incentives to state taxpayers who no longer itemize as a result of the new federal tax law. Arkansas is the latest state to receive Trump Administration approval for imposing a work and volunteering requirement that limits eligibility for individuals to participate in the Medicaid program. To date, 10 states have or are seeking such approval. Under the Arkansas plan, enrollees who do not work or volunteer with a charitable nonprofit at least 80 hours a month would lose coverage, perhaps as early as September. The work requirement exempts certain categories of people, such as those with opioid addiction and parents with dependent children. Elsewhere, legislation pending in Connecticut proposes to require adult Medicaid participants to work or perform community service at least 20 hours per week for eligibility, with certain limitations. “Community service” is defined as uncompensated labor for a nonprofit community service provider. A similar proposal in Wyoming, however, failed to pass earlier this month. Taxes: A bill in the New York State legislature would shift the burden onto nonprofits to annually establish that they have satisfied the requirements for real property tax exemption. Taxes: Property owned by nonprofits in New York City would be exempted from the city lien law process under newly proposed legislation. Fees: A public safety fee proposal was met with such “strong displeasure” by charitable nonprofits at a Dover, Delaware city council meeting that officials agreed to put off action for six weeks. The proposed ordinance would charge charitable organizations a one-cent per square foot fee despite the state-granted exemption from property taxes. Fees: A proposed ordinance in the city council in Reno, Nevada seeks to create a new business development district and charge property owners, including nonprofits, a fee to fund a private organization to provide public safety, cleaning, and marketing services for those in the district. The new fee would replace two special property tax assessments, neither of which nonprofits currently pay. A Maryland Senate bill would require that certain grants/contracts made with state or local funds reimburse nonprofits for indirect costs at the nonprofit’s federally approved indirect cost rate if one exists, or at least 10 percent of modified total direct costs as defined in the OMB Uniform Guidance. The bill’s sponsor, Senator Cheryl Kagan, identified the problem that “many organizations with State-funded grants or contracts receive limited reimbursement of 'indirect costs'— expenses for fundamental needs like office rent, accounting, and staff.” She explained her legislation, that is backed by Maryland Nonprofits, the state association of nonprofits, as follows, “By covering a portion of an organization's real cost of fulfilling a grant or contract, staff can stay focused on their critical work ... rather than scrambling to fill funding gaps.” If enacted, the legislation could serve as the model for state reforms that align federal and state/local grantmaking so that nonprofits provide services under one clear set of cost principles that mandate reimbursement of all or most of the organizations’ actual costs. Washington State: The Governor is expected today to sign the DISCLOSE Act, a measure that requires 501(c)(3) organizations to disclose donors for certain amounts donated for ballot measure advocacy. A new disclosure provision will be triggered if a charitable nonprofit donates $10,000 cash or in-kind support to another organization that is engaged in ballot measures. The nonprofit would have to disclose its top ten donors above $10,000, as well as any donors above $100,000, regardless of whether the money was earmarked for a specific purpose. West Virginia: A bill pushed by a national group calling itself "People United for Privacy" would have prohibited governments in West Virginia from forcing nonprofits to disclose donor information or from releasing, allowing to be released, or be required to release any record which identifies the association of a citizen with a 501(c)(3) organization. The bill also sought to exempt all donor information from the state’s Freedom of Information Act and would have provided a private right of action for any violation by the state or public agency. The legislation passed the Senate at the end of February, but died in a House committee when the legislature adjourned on March 10. In writing that opening paragraph, the editorial board of the Los Angeles Times, summarized the problem (politicizing houses of worship), identified the urgency of the threat (anti-Johnson Amendment rider potentially on the impending spending bill), and made clear its view (bad idea). The whole editorial, Don't weaken the ban on politics in the pulpit, March 6, 2018, is a must read for all who cherish the work of charitable, religious, and philanthropic organizations. Those opening lines draw readers into this powerful article, Keep Our Churches Purple, Sojourners Magazine, March 13, 2018, by the newly ordained minister, Rev. Jennifer Hawks, who also serves as associate general counsel at the Baptist Joint Committee for Religious Liberty. Okay, technically that’s the title of an action alert from the Utah Nonprofits Association, but it’s a hook nonetheless that deserves recognition. The March 6, 2018 alert explains, “Last year the White House and some well-funded special interests came dangerously close to repealing the longstanding law that protects nonprofit nonpartisanship, the Johnson Amendment. 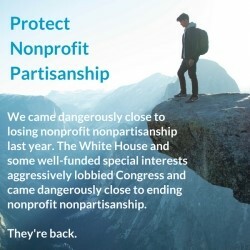 They are back.” A follow-up alert is titled: “LAWMAKERS ARE USING YOUR NONPROFIT'S INTEGRITY AS A BARGAINING CHIP.” The explanation of the typestyle? “Yes, we know that all caps means that we are shouting. We are shouting because nonprofit reputations are under attack and we need to be heard.” Points made. That’s the opening to an article in The Hill by Tim Delaney, President and CEO of the National Council of Nonprofits, entitled Setting the record straight on charities and political speech. In it, Delaney uses the Kellyanne Conway / Hatch Act news to show that everyone – from the White House to preachers in their pulpits – knows where the line is drawn between lawfully speaking about policy issues and unlawfully endorsing candidates for public office. - Lisa Maruyama, President and CEO of the Hawai`i Alliance of Nonprofit Organizations, writing in Politics From The Pulpit? Just Say No, Honolulu Civil Beat, March 14, 2018. - Philanthropy CA Statement on the Johnson Amendment, March 8, 2018. - Message from Jewish Federation of St. Joseph Valley official, South Bend, IN, submitted when signing the Community Letter in Support of Nonpartisanship, March 8, 2018. - Kentucky Pastor Lauren McDuffie, writing in “Keeping Our Sacred Spaces Sacred," EthicsDaily.com, March 5, 2018. New Threat in Congress to Politicize Nonprofits and Foundations, Ruth McCambridge, Nonprofit Quarterly, March 12, 2018, updating the latest challenges to the Johnson Amendment and what nonprofits and foundations need to be doing to protect nonprofit nonpartisanship. Advocacy BS, a podcast of the program 501(c)(3)(b)(s), March 12, 2018, in which host Zoot Velasco and guest David L. Thompson of the National Council of Nonprofits debunk the myth that 501(c)(3) organizations are not allowed to advocate for their missions. Running time: 58:00. - Angela Washington, resident at a Washington, DC, domestic violence residence run by a nonprofit, featured in a WTOP radio interview about a new report, 2017 DC Women’s Needs Assessment Report, that, among many other things, found that three out of four women in shelters have historical experiences of violence or threats to their safety, including domestic and intimate partner violence. Amount that the arts and cultural sector contributed to the U.S. economy in 2014, more than agriculture, transportation, or warehousing, and roughly 4.2% of the U.S. economy for that year. The National Endowment for the Arts annual budget, as a point of comparison, is just $148 million. Source: The Arts Contribute More Than $760 Billion to the U.S. Economy, U.S. Bureau of Economic Analysis and the National Endowment for the Arts, March 6, 2018. See also, Creative Work Force State Profiles, an interactive dashboard that reveals key employment and compensation statistics for individual states, and allows regional comparisons, shows how arts and cultural employment compares to other industries, and illustrates trends over time.